This past fall Laurier’s Physical Resources department updated the signs at all single-use restrooms at the Brantford campus. The male and female icons that had previously marked the restrooms were replaced with new signs, free of any gendered symbols. It’s a seemingly small change, but one that a group of Laurier graduate students hopes will send a message of safety and inclusivity for all on campus. 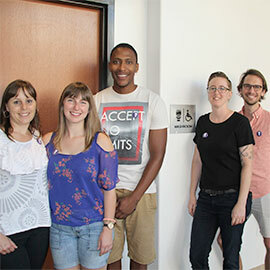 A cohort of 13 students from the university’s master’s program in Social Justice and Community Engagement (SJCE) drove the washroom sign change initiative. Each year students in this graduate program work together on a legacy project of their choosing, with a goal of creating lasting change on campus. The 2015/16 class set their sights on washroom signage. The entire project was about one year in the making. The students began their research in October of 2015. They collaborated with campus administration to develop and approve a final design, and to produce and install the new signs. Funding to cover costs associated with the change was secured from Laurier's Sustainable Hawk Fund program. By late September of 2016, the class celebrated with an official sign unveiling at a restroom in the Research and Academic Centre. The students who led this initiative will see their legacy spread beyond the Brantford campus. A new sign has been installed marking an accessible, inclusive restroom at the Lyle S. Hallman Faculty of Social Work in Kitchener, and plans are underway to roll out a similar signage program at Laurier’s campus in Waterloo.